This article explains how to back up VMware VMs running on VMware ESXi hosts/vCenter Server to Azure using Azure Backup Server. Set up a secure channel so that Azure Backup Server can communicate with VMware servers over HTTPS. 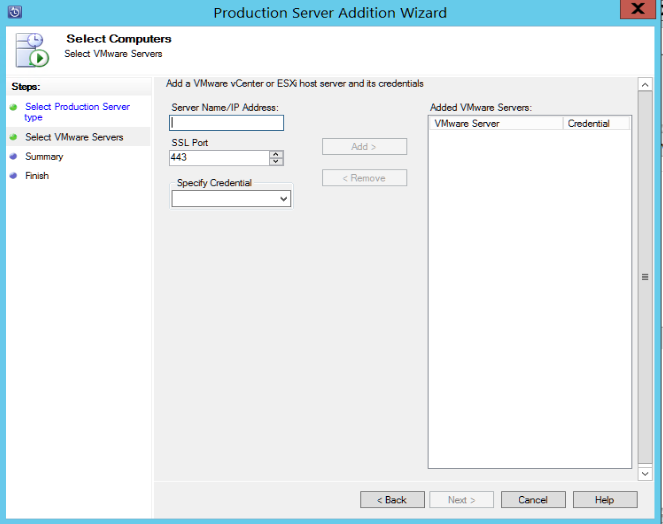 Set up a VMware account that Azure Backup Server uses to access the VMware server. Add the account credentials to Azure Backup. 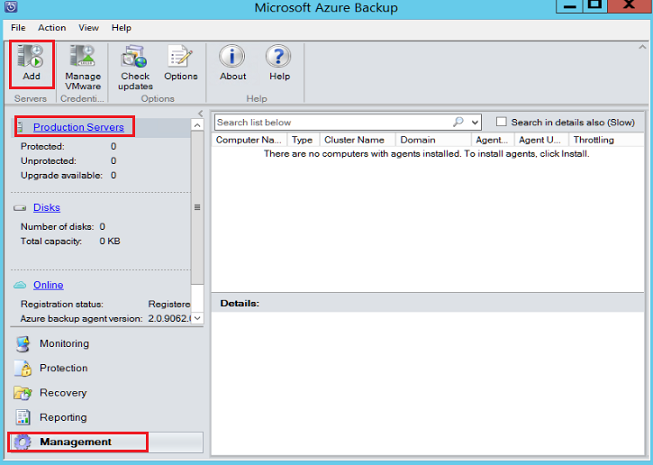 Add the vCenter or ESXi server to Azure Backup Server. Set up a protection group that contains the VMware VMs you want to back up, specify backup settings, and schedule the backup. Verify that you're running a version of vCenter/ESXi that's supported for backup - versions 6.5, 6.0, and 5.5. Make sure you've set up Azure Backup Server. If you haven't, do that before you start. You should be running Azure Backup Server with the latest updates. By default, Azure Backup Server communicates with VMware servers over HTTPS. To set up the HTTPS connection, download the VMware Certificate Authority (CA) certificate, and import it on the Azure Backup Server. If you don't want to use HTTPS you can disable the default setting. 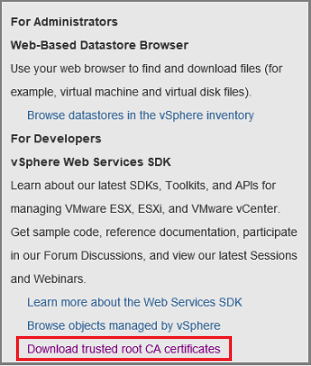 You typically connect from a browser on the Azure Backup Server machine to the vCenter/ESXi server using the vSphere Web Client. The first time you do this the connection isn't secure and will show the following. It's important to understand how Azure Backup Server handles backups. As a first step Azure Backup Server backs up data to local disk storage. Azure Backup Server uses a storage pool, a set of disks and volumes on which Azure Backup Server stores disk recovery points for its protected data. The storage pool can be directly attached storage (DAS), a fiber channel SAN, or iSCSI storage device or SAN. It's important to ensure that you have sufficient storage for local back up of your VMware VM data. Azure Backup Server then backs up from the local disk storage to Azure. Get help to figure out how much storage space you need. The information is for DPM but can be used for Azure Backup Server too. In the browser on Azure Backup Server, enter the vSphere Web Client URL. If the login page doesn't appear, verify the connection and browser proxy settings. On the vSphere Web Client login page, click Download trusted root CA certificates. A file named download is downloaded. Depending on your browser, you receive a message that asks whether to open or save the file. Save the file on the Azure Backup Server machine with a .zip extension. The root certificate file with an extension that begins with a numbered sequence like .0 and .1. The CRL file has an extension that begins with a sequence like .r0 or .r1. The CRL file is associated with a certificate. In the certs folder, right-click the root certificate file > Rename. Change the root certificate's extension to .crt, and confirm. The file icon changes to one that represents a root certificate. 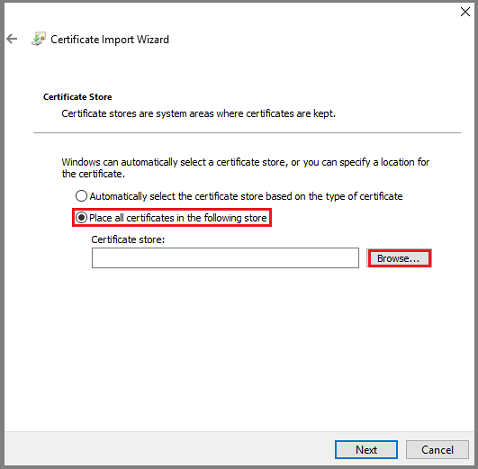 Right-click the root certificate and from the pop-up menu, select Install Certificate. 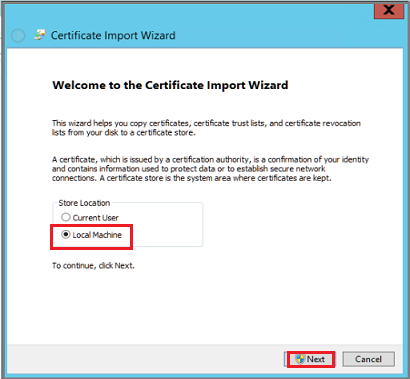 In Certificate Import Wizard, select Local Machine as the destination for the certificate, and then click Next. Confirm if you're asked if you want to allow changes to the computer. On the Certificate Store page, select Place all certificates in the following store, and then click Browse to choose the certificate store. 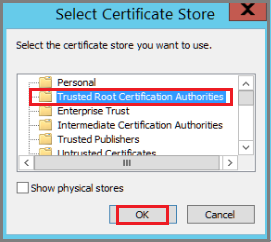 In Select Certificate Store, select Trusted Root Certification Authorities as the destination folder for the certificates, and then click OK. 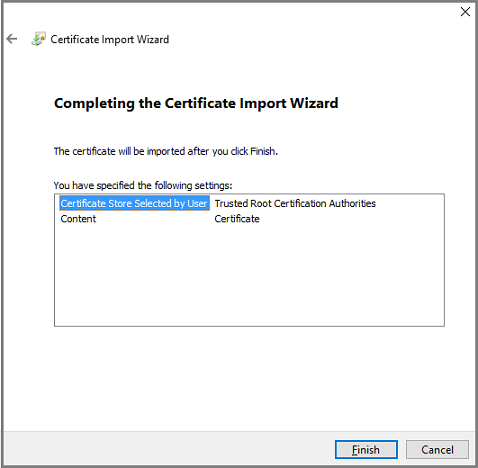 In Completing the Certificate Import Wizard, verify the folder, and then click Finish. After the certificate import is confirmed, sign in to the vCenter Server to confirm that your connection is secure. Save the file on the Azure Backup Server machine with the name DisableSecureAuthentication.reg. 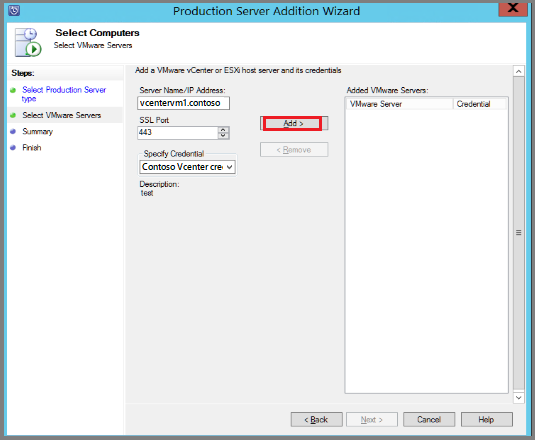 The Azure Backup Server needs a user account with permissions to access v-Center Server/ESXi host. 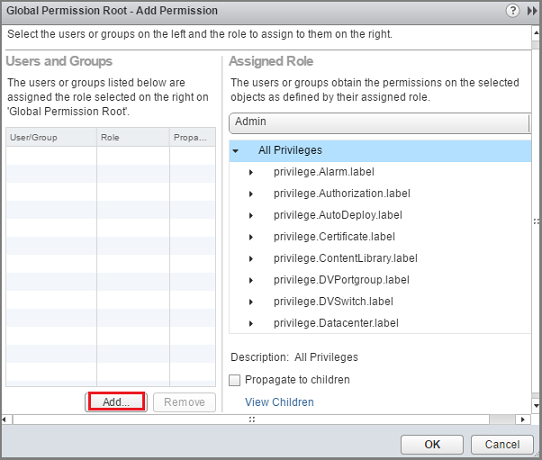 Create a VMware role with specific privileges, and then associate a user account with the role. 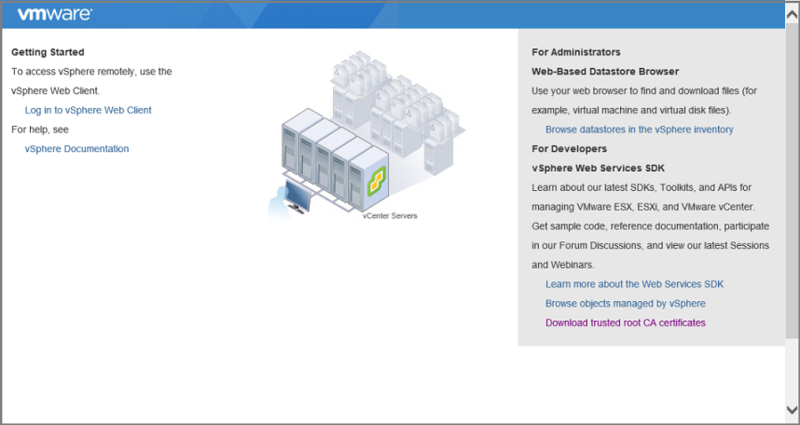 Sign in to the vCenter Server (or ESXi host if you're not using vCenter Server). In the Navigator panel, click Administration. In Administration > Roles, click the add role icon (the + symbol). In Create Role > Role name, enter BackupAdminRole. The role name can be whatever you like, but it should be recognizable for the role's purpose. Select the privileges as summarized in the table below, and then click OK. The new role appears on the list in the Roles panel. Click the icon next to the parent label to expand the parent and view the child privileges. To select the VirtualMachine privileges, you need to go several levels into the parent child hierarchy. You don't need to select all child privileges within a parent privilege. 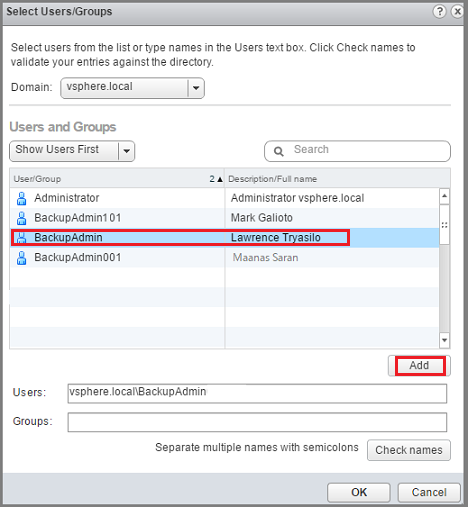 In vCenter Server Navigator panel, click Users and Groups. If you don't use vCenter Server, create the account on the appropriate ESXi host. The vCenter Users and Groups panel appear. 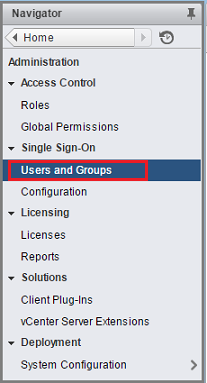 In the vCenter Users and Groups panel, select the Users tab, and then click the add users icon (the + symbol). In New User dialog box, add the user information > OK. In this procedure, the username is BackupAdmin. To associate the user account with the role, in the Navigator panel, click Global Permissions. In the Global Permissions panel, select the Manage tab, and then click the add icon (the + symbol). In Global Permission Root - Add Permission, click Add to choose the user or group. 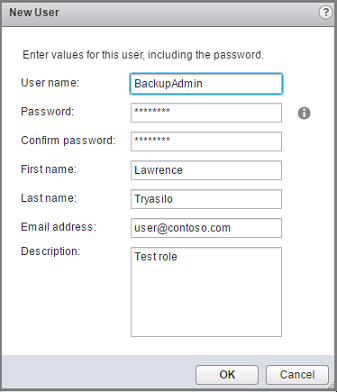 In Select Users/Groups, choose BackupAdmin > Add. In Users, the domain\username format is used for the user account. If you want to use a different domain, choose it from the Domain list. Click OK to add the selected users to the Add Permission dialog box. 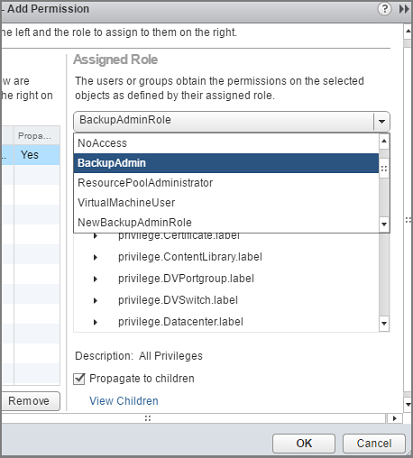 In Assigned Role, from the drop-down list, select BackupAdminRole > OK.
On the Manage tab in the Global Permissions panel, the new user account and the associated role appear in the list. Open Azure Backup Server. If you can't find the icon on the desktop, open Microsoft Azure Backup from the apps list. 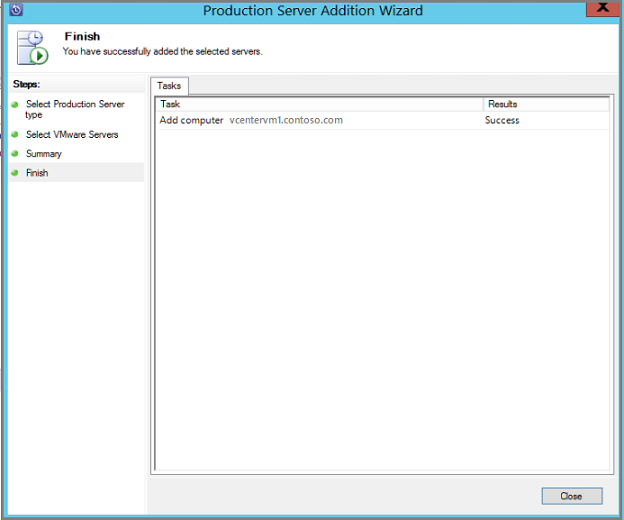 In the Azure Backup Server console, click Management > Production Servers > Manage VMware. 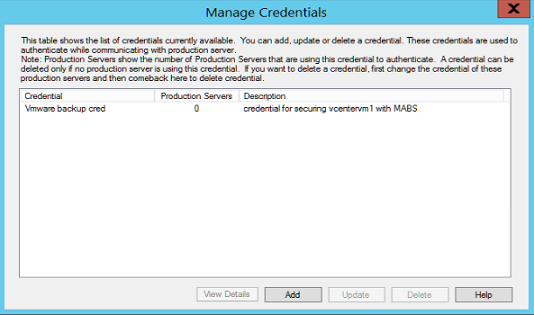 In the Manage Credentials dialog box, click Add. 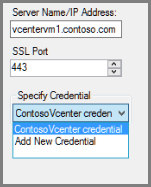 In Add Credential , enter a name and a description for the new credential, and specify the username and password you defined on the VMware server. 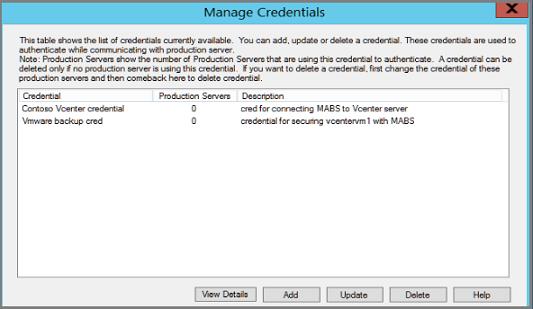 The name, Contoso Vcenter credential is used to identify the credential in this procedure. If the VMware server and Azure Backup Server aren't in the same domain, specify the domain in the user name. Click Add to add the new credential. Add the vCenter Server to Azure Backup Server. 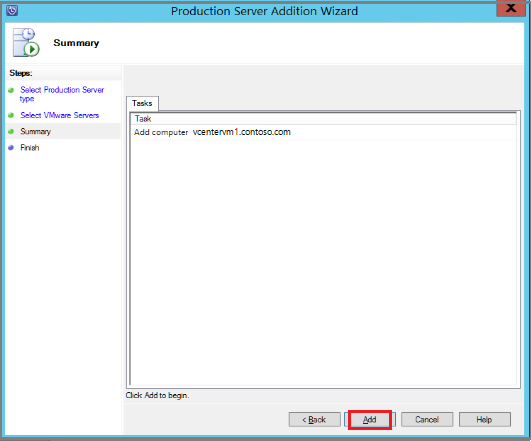 In the Azure Backup Server console, click Management > Production Servers > Add. 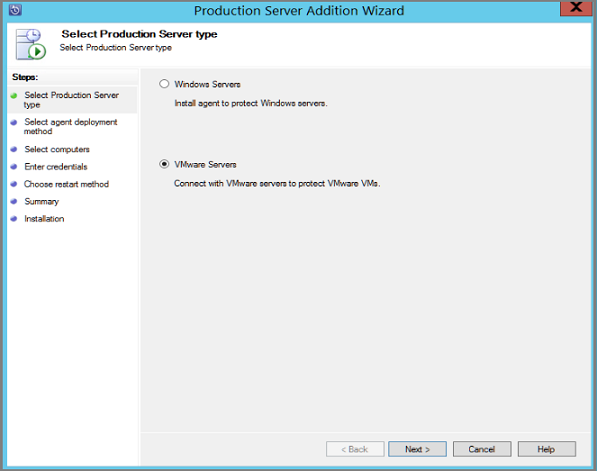 In Production Server Addition Wizard > Select Production Server type page, select VMware Servers, and then click Next. In Select Computers Server Name/IP Address, specify the FQDN or IP address of the VMware server. If all the ESXi servers are managed by the same vCenter, specify the vCenter name. Otherwise, add the ESXi host. In SSL Port, enter the port that's used to communicate with the VMware server. 443 is the default port, but you can change it if your VMware server listens on a different port. Click Add to add the VMware server to the servers list. Then click Next. 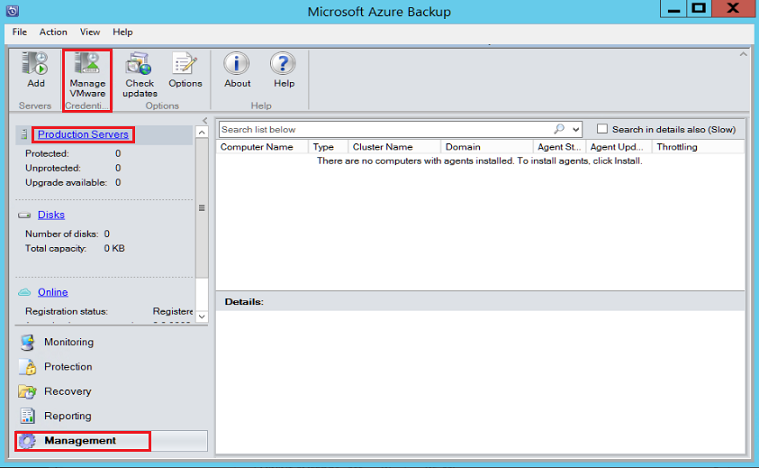 In the Summary page, click Add to add the VMware server to Azure Backup Server. The new server is added immediately, no agent is needed on the VMware server. Verify settings on the Finish page. If you have multiple ESXi hosts that aren't managed by vCenter server, or you have multiple instances of vCenter Server, you need to rerun the wizard to add the servers. Add VMware VMs for backup. Protection groups gather multiple VMs and apply the same data retention and backup settings to all VMs in the group. 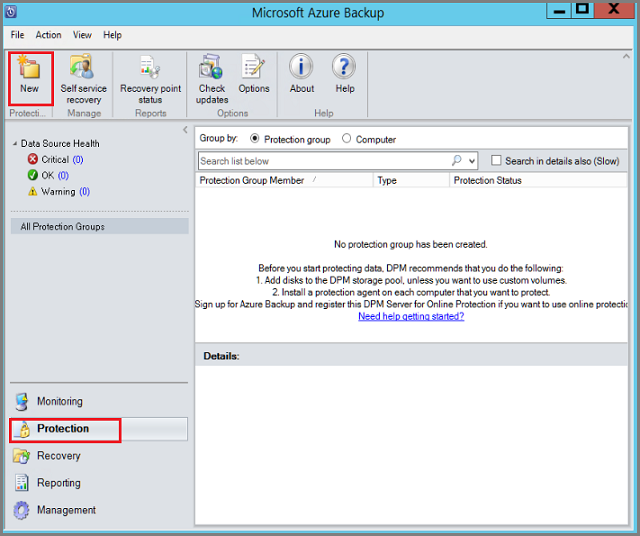 In the Azure Backup Server console, click Protection, > New. In the Create New Protection Group wizard welcome page, click Next. On the Select Protection group type page, select Servers and then click Next. The Select group members page appears. In Select group members > select the VMs (or VM folders) that you want to back up. Then click Next. When you select a folder, or VMs or folders inside that folder are also selected for backup. You can uncheck folders or VMs you don't want to back up. If a VM or folder is already being backed up, you can't select it. 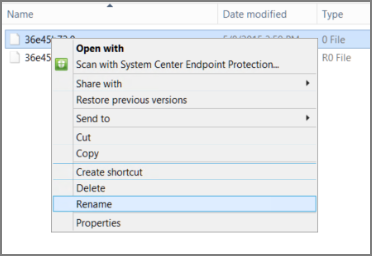 This ensure that duplicate recovery points aren't created for a VM. . 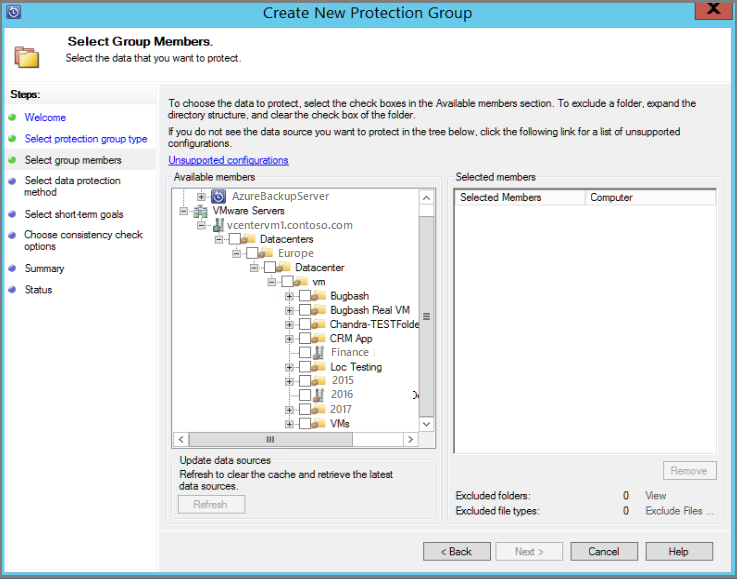 In Select Data Protection Method page, enter a name for the protection group, and protection settings. To back up to Azure, set short-term protection to Disk and enable online protection. Then click Next. In Specify Short-Term Goals, specify how long you want to keep data backed up to disk. 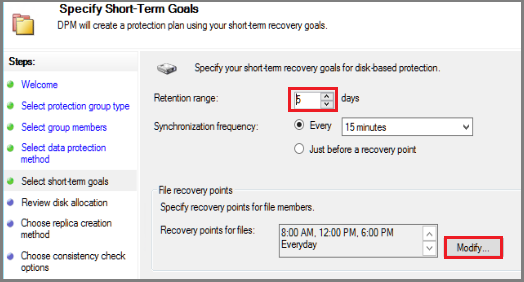 In Retention Range, specify how many days disk recovery points should be kept. In Synchronization frequency, specify how often disk recovery points are taken. If you don't want to set a back up interval you can check Just before a recovery point so that a backup runs just before each recovery point is scheduled. Short-term backups are full backups and not incremental. Click Modify to change the times/dates when short-term backups occur. In Review Disk Allocation, review the disk space provided for the VM backups. for the VMs. The recommended disk allocations are based on the retention range you specified, the type of workload, and the size of the protected data. Make any changes required, and then click Next. Data size: Size of the data in the protection group. Disk space: The recommended amount of disk space for the protection group. If you want to modify this setting, you should allocate total space that is slightly larger than the amount that you estimate each data source grows. Colocate data: If you turn on colocation, multiple data sources in the protection can map to a single replica and recovery point volume. Colocation isn't supported for all workloads. Automatically grow: If you turn on this setting, if data in the protected group outgrows the initial allocation, Azure Backup Server tries to increase the disk size by 25 percent. Storage pool details: Shows the status of the storage pool, including total and remaining disk size. In Choose Replica Creation Method page, specify how you want to take the initial backup, and then click Next. The default is Automatically over the network and Now. If you use the default, we recommend that you specify an off-peak time. Choose Later and specify a day and time. For large amounts of data or less-than-optimal network conditions, consider replicating the data offline by using removable media. In Consistency Check Options, select how and when to automate the consistency checks. Then click Next. You can run consistency checks when replica data becomes inconsistent, or on a set schedule. If you don't want to configure automatic consistency checks, you can run a manual check. To do this, right-click the protection group > Perform Consistency Check. In Specify Online Protection Data page, select the VMs or VM folders that you want to back up. You can select the members individually, or click Select All to choose all members. Then click Next. On the Specify Online Backup Schedule page, specify how often you want to back up data from local storage to Azure. Cloud recovery points for the data will be generated according to the schedule. Then click Next. After the recovery point is generated, it is transferred to the Recovery Services vault in Azure. On the Specify Online Retention Policy page, indicate how long you want to keep the recovery points that are created from the daily/weekly/monthly/yearly backups to Azure. then click Next. There's no time limit for how long you can keep data in Azure. The only limit is that you can't have more than 9999 recovery points per protected instance. In this example, the protected instance is the VMware server. On the Summary page, review the settings, and then click Create Group. VMWare 6.7 onwards had enabled TLS as communication protocol. For troubleshooting issues when setting up backups, review the troubleshooting guide for Azure Backup Server.